Ski season is now officially here. Snow lovers, rejoice! So what better time to treat that ski fanatic in your life, especially as there is so much awesome winter sports tech around. So whether you're looking for gifts for ski racers, or maybe the best gifts for cross country skiers, we've got you covered. From gear to gadgets, this is the ultimate round-up of extreme sports presents you can buy. For more sporty gift ideas, check out our best running shoes to buy round-up, our definitive list of the best fitness bands to buy and the best trail running shoes. Stick one of these homing tags onto your skis or board and you'll never have to worry about losing them again. Thanks to RF tech, the tags connect to a receiver and if one goes missing, you can ping it and it'll make a sound. 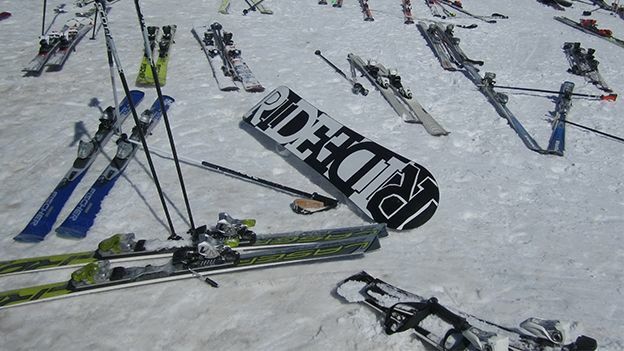 It has a 30m range and will work even if your ski is buried under 1m of snow. Offering value for money, yet keeping your eyes fully protected at the same time. Oleophobic lenses stop rain and oil sticking to the specs, while B88 nylon frames keep the weight down and the durability up. Bolle's polarised lenses eliminate glare and maximise contrast, giving you the best possible view down the mountain. An instep flex panel and elastic arch, combined with proper ankle support ensures the sock moves with your foot, staying comfy the whole day. The wool construction adds much needed warmth, but it'll also wick away excess moisture, stopping it building up in your boot. The Core successfully marries the worlds of style and tech, which is surprisingly rare in watches these days. Not only does it look classy, it's packed full of alpine tech, including a barometer, altimeter, thermometer and compass, as well as the usual time and alarm gubbins. The best way to keep your digits toasty warm on the piste, while looking mighty fine at the same time. Natural leather palms, treated with 3M Scotchgard tech are combined with Gore-Tex inserts to ensure your dry and warm as you weave downhill. These in-ear buds offer loads of nifty tech for the winter sports fan, but they don't sacrifice the most important thing - sound quality. The integrated heart rate monitor keeps a track of your vital stats, while real time voice coaching pushes you to always do better. They're wireless too, so those pesky wires won't get caught up in your kit. If wearing earbuds and a skiing or boarding helmet results in an uncomfortable experience, these Sound Pads could be the ideal alternative. Fitting inside the helmet, they produce great sounding noise, with impressive bass and a good hit of volume and connect directly to your iPhone or music player. This 30-litre pack is ideal for those who love to keep their camera and laptop close at hand when they're on the slopes. As well as bespoke pockets for tech, the Focus has straps for your board and tripod too, and the whole lot is made of tough-as-nails Cordura. Is there anything worse than freezing cold feet trapped inside a pair of snow boots? We say no! Falke's half slipper, half sock boot liner is made from soft merino wool and it'll keep your toes toasty all day long.